TRAP DESCRIPTION: 4" T x 11" W x 24" L. This is the larger of the metal crayfish traps which we sell. These traps are designed to catch and hold crayfish. These are submersible repeating type traps and can catch several crayfish in one set. It features funnel type openings on either end through which foraging crayfish enter. 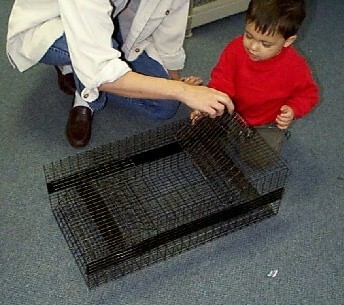 Once inside, the small hole to the funnel is virtually impossible for them to see so they will simply sit in the trap until removed. Removal of the trapped crayfish is done via a door on top.